These are good quality T shirt bags. A little thicker than others for basically the same price make them a winner. This is a never be without item for takeout business. I love these "Thank You" T-Shirt Bags because they come in handy for every to-go order. I would recommend to any restaurant with to-go orders. These are very nice bags. it is strong, doesn't rip easily, and the handles are long and strong too. It can fit/ hold about 3 of our take out dishes. Good quality for the price and for the amount. These thank you T-Shirt bags are great for carry out containers. We use 8 x 8 and 9 x 9 styrofoam containers and 3 fit in each bag. They have a nice thickness and we will continue to use. These bags are great for our grab and go orders. Packaged well, they unfold easily and come apart with no issues. Holds up to our warm food with no melt throughs. A terrific style bag for our candy shop and a great price per thousand bags. A great way to package up candy and other lightweight items. Love these bags. They are a good size suitable for many purposes and at 1,000/case, they are also at a great price. They are durable and hold up well no matter what you are using them for. I like the 'Thank You' printing on the bags, it is just another nice touch. Recommend them highly. Surprisingly strong for their light weight. "Thank you!" is always nice to see on a bag. Cheerful, friendly message. It feels ironic when you have poor service, but if you make a practice of treating customers well, the "Thank you!" on your bag will mean more to them than any memory of a custom logo would. Grocery or take out thank you bag they all are very handy we buy a new case every week defiantly will purchase again and again!!! These thank you bags are great. The price is wonderful. We go through a lot of them and will continue to purchase. We definitely recommend them to everyone. Great standard bags. The thank you print on the outside is great for any business. The bags themselves are a great standard size and fairly good quality. The price is also good for the amount of bags. This is another great product to have in your grocery store ! They do not brake easily ! These bags are recommended for my family and friends ! These bags work very well and are definitely worth it for the price. We do wish that they would come apart easier, but aside from that they have done the job. standard t shirt bag that's good for to go orders. nothing special and a little thin but it does the job and we're happy with them. These bags do not look cheap. They are a little bigger than your usual ones and they are heavy duty. We can fit 3 food containers and there is still enough to tie. Great bag for puttting salads, subs, or anything else you need. Works just like grocery store bags. And once again, prices and quantities can't be beat on WebstaurantStore. 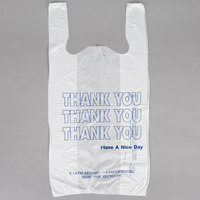 These white thank you bags are great for larger lunch items to go. They don't take up very much room and are very handy to use. We wanted a cheap tshirt bag for our store. We liked this generic Thank you bag and it worked well at a great price. We also tried the Green Biodegradeable tshirt bags. While they do cost a bit more, they are still very reasonably priced and we liked having the green color and biodegradeable feature so we switched to those. was a great decision to order the cases of bags. the customers are very happy to have there goods bagged up instead of trying to hold everything and walk with them. The bags are as I expected (thin) but do the job that we use them for. I have found a few bags that are not sealed but it has only been a handful and nothing that would cause me not to order these again in the future. These white t-shirt thank you bags are a great buy. The handles are sturdy and it is overall good quality. We highly recommend this product. These white tshirt bags are the perfect size for holding to go orders. The containers fit nicely and your customer are happy not having to carry several bags. I found that these bags are much more thicker than the average plastic bags. They are easy to open and we can easily fit all of our takeout food in them. For 1000 bags in a case, the price is amazing. These bags are a great size for packaging items. Also I found the bags thicker than the usual t shirt bags found in discount stores. Nice basic plastic bag at a economical cost. They're pretty tough too, we use them mostly for frozen meat at the Farmers' Market, they hold for instance 2 5lb chickens. Had wanted to get a "green" bag, but was out of stock at the time, will be trying those type in the future. Great Quality Bag for the price you pay.! We have never have any issues with rips or tears. Would buy again in the future ! I love this kind of T-Shirt Bags, it can hold many things. it is very convenient to bring. And they were kept very well when i received them. Great price on these plastic bags! We tell our customers "thank you" all the time and these bags tell them once again that you appreciate their business. this white "thank you " bag is a great looking product. they hold our to -go boxes perfectly. and easy to open and hang. and at this price its a super deal. I always keep these on hand in the car. We love to shop the discount store where there are no bags available. We just bring in our own. When we are done with them, they made great liners for our bathroom trash cans. They are made very well, with no holes or leaks like many I get from my local grocery. These bags don't rip with the first item put into it which is awesome! They easily hold a gallon of milk and seem to withstand a lot of pressure. Great product and price is good too. We can use these bags without doubling them like we have had to do with bags we purchased at a big discount store. Highly recommended for retail operation. We operate a direct-sales ranch that sells frozen meats and (unfrozen) eggs primarily at farmers markets. After loads of trouble with the cheap wholesale club bags--tearing, poor bag manufacturing, messed up handles, and generally weak plastic--we were fed up. I searched for a heavy duty t-shirt bag that could deal with some sharp edges and hold at least 10 lb of product. These bags are great. They still sometimes tear on items with very sharp corners, but in general, I trust these bags to hand to a customer with 12 lb of stuff, single-bagged, and that customer is going to make it to their car without disaster. These are my go-to bags from now on. I hate even thinking of having to buy those other bags ever again! Great heavy duty bags. They hardly rip and they feel like much better quality than ones we bought from a wholesale club. We will definitely reorder. Excellent Bags for Business or Personal use. Inexpensive, durable and quite sturdy. Size is perfect to give carryout containers. Can be used for groceries too. Bought these on accident i didnt realize they were the grocery type but they worked perfect for our takeout customers and the print on them is great!